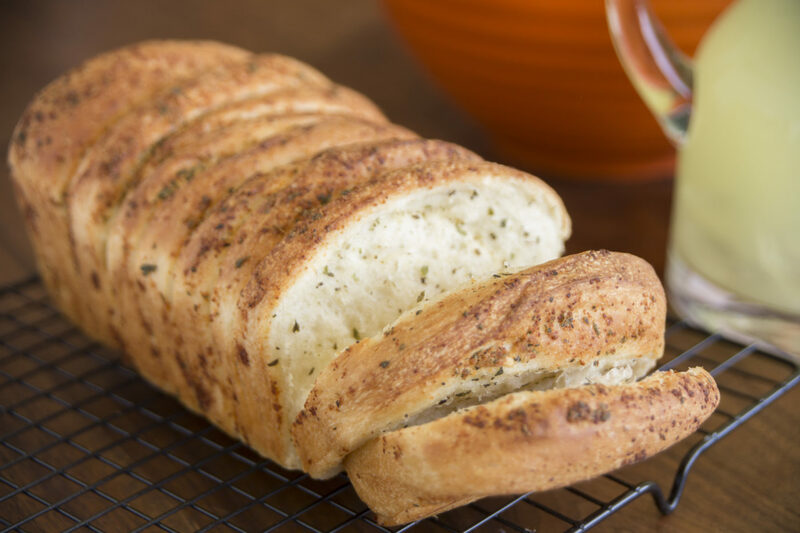 Start the New Year right with this fabulous Herb Bread recipe. It’s great for any time or occasion. Cut partially thawed loaf into 12 1/2-inch slices, not quite cutting all the way through. Place sliced loaf in a sprayed 8 1/2×4 1/2×2 1/2-inch bread pan. In a small bowl, combine butter, seasonings, salt and cheese. Brush each slice, front and back with butter mixture. Pour any remaining mixture over the top. Cover with plastic wrap and let rise until 1 inch over top of pan. Remove wrap and bake at 350°F 20-30 minutes. Thank you for your email. Sorry you had trouble with this recipe. Be sure to check the “best by” date on the package to make sure your yeast is still active and will rise. That may have been the problem. And I think you might have let it thaw more (probably just until it begins to rise – so it’s not still frozen). We would be happy to send you a replacement coupon to use our product again. Just call our Customer Satisfaction Department at 1-800-876-7333. One of our Customer Satisfaction representatives would be happy to help you!